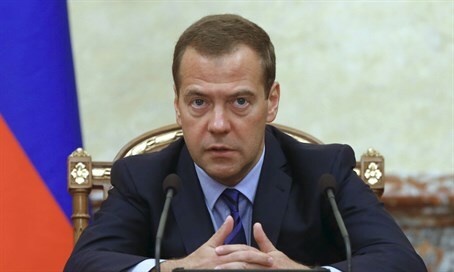 Russia is preparing a raft of retaliatory economic measures against Turkey after Ankara downed one of its warplanes, Prime Minister Dmitry Medvedev said Thursday - with Israel among several countries likely to benefit as Moscow looks for alternative trading and tourism partners. "The government has been ordered to work out a system of response measures to this act of aggression in the economic and humanitarian spheres," Medvedev told a cabinet meeting in televised comments. He said under Russian law the broad punitive steps could include halting joint economic projects, restricting financial and trade transactions and changing customs duties. Measures could also target the tourism and transport sectors, labor markets and "humanitarian contacts", Medvedev said. The measures would then likely be listed in a decree from President Vladimir Putin, Medvedev said. "In these documents the focus will be on introducing limits or bans on the economic activities of Turkish economic structures working in Russia, a limitation of the supply of products, including food products, and on the work and provision of services by Turkish companies and other restrictive measures," Medvedev said. "I propose doing all this in a period of two days so that we can move to setting up the appropriate procedures as quickly as possible," Medvedev told government ministers. Economy minister Alexei Ulyukayev did not rule out that the measures could hit two major projects with Turkey - the planned Turk Stream gas pipeline and the Akkuyu nuclear power plant - in a move that looked set to rattle cages in Ankara. Energy-poor Turkey relies on Russia for over half of its natural gas imports and the two sides agreed to build the pipeline under the Black Sea. Moscow has also started building Turkey's first nuclear power station in the south of the country. Tensions have soared between Moscow and Ankara following the downing of the Russian jet on the Syrian border on Tuesday. "We'll buy from Israel instead"
Moscow has already warned its nationals against visiting Turkey and stepped up controls of Turkish agricultural imports. Those two moves represent a major blow to the Turkish economy; until now Turkey was a favorite for Russian tourists, and Russia's large population makes it a lucrative market for agricultural exports. Some 4% of Russia's total food imports come from Turkey. Some 15 percent of Turkish agricultural produce does not meet Russian standards with levels of pesticides, nitrates and nitrites considerably above safe limits, Agriculture Minister Alexander Tkachev said. "Taking into account repeated violations by Turkish producers of Russian norms, the Russian government has tasked (the food safety agency) Rosselkhoznadzor with reinforcing control over supplies of agricultural produce and food from Turkey," Tkachev said. Russia will "organize additional checks at the border and at food production sites in Turkey," he said. Russia has found "traces of banned and harmful substances" in Turkish food products of animal origin some 40 times this year, Tkachev added. Russia is pulling out all the stops in response to NATO member Turkey shooting down its military plane. While ruling out military retaliation against Ankara, officials have promised a barrage of economic and political measures.